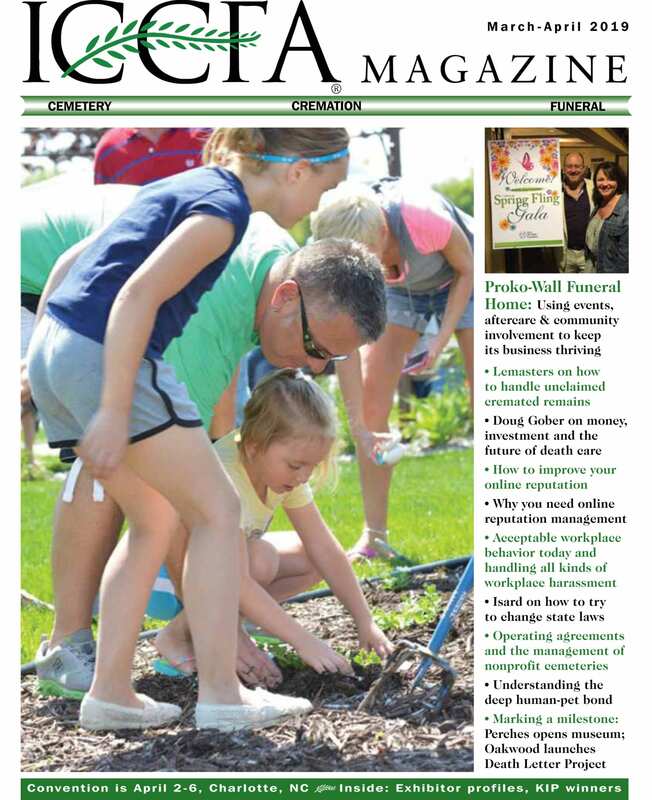 ICCFA Magazine is the flagship, award-winning publication of the International Cemetery, Cremation and Funeral Association. Published 10 times per year, ICCFA Magazine is the only official publication of the ICCFA. With a mix of in-depth features, timely industry news, exclusive government and legislative reports and updates on association activities, ICCFA Magazine is an indispensable resource for our readers. Articles are written by influential cemetery, crematory, funeral service and memorialization leaders who share practical, “how to” advice on topics ranging from pre-need sales, to cremation, to management practices, to maintenance and more. Going to the ICCFA homepage and clicking on “Create New Account” in the upper righthand corner. Once you complete the form, an ICCFA staff member will receive a notification. After your membership has been verified, you will be flagged as a member and receive all membership privileges, including the ability to read the magazine online. Please allow one business day for this process to take place. For more information about advertising and exhibiting, contact Rick Platter, Supplier Relations Manager at 800.645.7700 or email rplatter@iccfa.com. ICCFA Magazine welcomes submissions of news items, articles and letters to the editor. For more information, contact ICCFA Magazine’s managing editor at sloving@iccfa.com.